In 1924 the Royal Navy’s Special Service Squadron visited Australia and New Zealand. HMAS Adelaide Joined in Australia. 27 February–01 March 1924: At Fremantle/Perth, Western Australia. Distance from Singapore: 2,356 miles. Total distance covered since leaving Devonport: 15,719 miles. 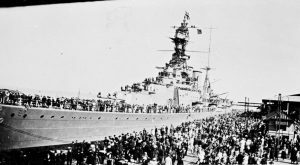 Hood‘s Naval Brigade marches through both Perth and Fremantle. Departed for Albany, Western Australia on 01 March. 01–02 March 1924: Enroute to Albany, Western Australia. 02–06 March 1924: At Albany, Western Australia. Distance from Freemantle: 403 miles. Total distance covered: 16,122 miles. Crew resumed regular rig. The squadron departed for Adelaide, South Australia on 06 March. 06–10 March 1924: Enroute to Adelaide, South Australia. 10–15 March, 1924: At Adelaide, South Australia. Distance from Albany: 1,046 miles. Total distance covered at this point: 17,168 miles. The Squadron was visited by over 69,510 visitors. The ships departed for Melbourne, Victoria on 15 March. 15–17 March 1924: Enroute to Melbourne, Victoria. 17–25 March 1924: At Melbourne, Victoria. Distance from Adelaide: 526 miles. Total distance covered: 17,694 miles. Signal Boatswain Albert Punshon died after suffering a heart attack. The crew participated in several social events and sporting matches. Additionally, the Naval Brigade marched through the city on 18 March. The squadron departed for Hobart, Tasmania on 25 March. 25–27 March 1924: Enroute to Hobart, Tasmania. 27 March–03 April 1924: Arrived at Hobart, Tasmania. Distance from Melbourne: 557 miles. Total distance travelled: 18,251 miles. The squadron departed for Jervis Bay, New South Wales on 03 April. 03–05 April 1924: Enroute to Jervis Bay, New South Wales. Briefly stopped in Twofold Bay, New South Wales on 04 April. 05–08 April 1924: At Jervis Bay, New South Wales. Distance from Hobart: 577 miles. Total distance from Devonport: 18,828 miles. The squadron departed for Sydney, New South Wales on 08 April. 08–09 April 1924: Enroute to Sydney, New South Wales. 09–20 April 1924: At Sydney, New South Wales. Distance from Jervis Bay: 93 miles. Total distance from Devonport: 18,921 miles. Hood‘s Naval Brigade marched through the city on 09 April. The following day, the ship was placed in “At Home” status. Musical revue held aboard the ship. Departed for Wellington, New Zealand on 20 April. The squadron was joined by H.M.A.S. Adelaide upon departure.